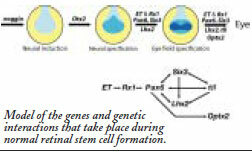 Stem cells have the ability to differentiate into specialized cells. A retinal stem cell, for example, may become a rod cell, a cone cell, or any of the five other types cells in the retina. 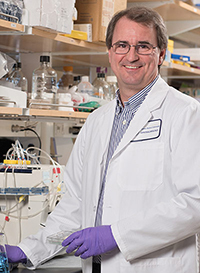 Dr. Michael E. Zuber has been characterizing genes that control how retinal stem cells differentiate in the frog. The retina of a frog is remarkably similar to the human retina, making it ideal to study retinal stem cell formation and differentiation. Dr. Zuber is also studying how these genes interact during differentiation, what factors control differentiation, and how retinal stem cells might be produced in a culture dish. This knowledge could lead to retinal stem cell treatments for blinding diseases such as age-related macular degeneration, retinitis pigmentosa, and glaucoma. 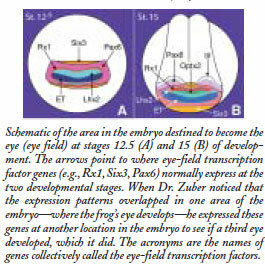 To identify genes involved in differentiation, Dr. Zuber began by studying how the frog’s embryonic retinal cells form and how they develop into rods, cones, and other retinal cell types. He discovered that eight transcription factors are sufficient for normal eye formation and that these same factors were also active in developing embryonic retinal stem cells. Dr. Zuber’s next step was to force the expression of these factors in a frog embryo. When he did this, a third eye developed in the frog. He had induced the formation of retinal stem cells that gave rise to all the cells of the adult eye. This signal achievement provided a powerful tool for identifying the genes necessary to produce retinal stem cells. So far, Dr. Zuber has determined that eight genes are sufficient to form a complete eye. When he discovers how these genes work together to form retinal stem cells, it may be possible to generate an unlimited supply of a patient’s own retinal stem cells to replace adult eye cells lost as a result of retinal injury or disease. Dr. Zuber received the Career Development Award from Research to Prevent Blindness, which funds his research. He is also the recipient of a Hitchings-Elion Postdoctoral Fellowship from the Burroughs Wellcome Fund and a Predoctoral Research Fellowship from Merck & Company Inc. He collaborates with Drs. Andrea S. Viczian, Eduardo Solessio, and Barry Knox, as well as scientists at Cambridge University in England, University of Pisa in Italy, and The Salk Institute for Biological Studies in San Diego. His work is published in Cell, Development, Molecular and Cellular Biology, Journal of Biological Chemistry, Journal of Cellular Physiology, Molecular Reproduction and Development, and Annals of the New York Academy of Sciences. Dr. Zuber also reviews manuscripts for scientific journals and has contributed to three scientific textbooks. He is a member of the American Association for the Advancement of Science, Society for Neuroscience, and Society for Developmental Biology.